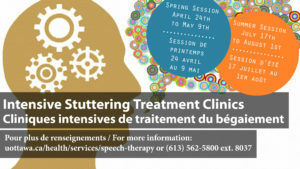 The Speech Language Pathology Clinic and Stuttering Treatment Clinic at the University of Ottawa announces spring and summer intensive treatment clinics for full-time clients as well as those wishing to attend for one or two days of “refresher” treatment. See pdf poster here. 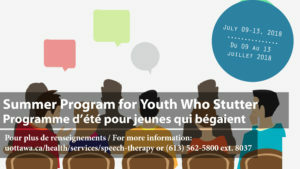 The clinic is also offering a one-week “camp” for teens who stutter. See pdf poster here. There may be financial assistance through the Marie Poulos Fund.